GEORGE A DICKEL & CO. 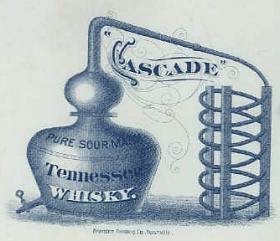 The Cascade Distillery was established ca. 1866. It was located near Gage Creek a few miles from Tullhoma in Coffee County, TN. In 1888, V. E. Schwab purchased an interest in the distillery from Matthew Sims and McLin H Davis. By 1898, he was sole proprietor. V. E. Schwab was initially an employee of George A Dickel & Co., a wine and liquor store in Nashville that listed at 2 N Market as early as 1874. Schwab later became Geo. Dickel's partner and brother-in-law. Geo. A Dickel & Co. bottled the product of the Cascade distillery and distributed it; George is reported to have dubbed the whiskey as being "Mellow as Moonlight". Geo. A Dickel died in 1894 but the company continued under Schwab's control until prohibition. Manufacture of whiskey in Tennessee was prohibited in 1909 and the distillery moved operations to Hopkinsville, KY and then finally to Louisville. George A Dickel & Co. lists in Nashville directories from 1874-1915. The directories also show the "Cascade Distilling Co." located at 201 2 nd Ave N in 1909. "Cascade", "Cascade", and "Geo. A. Dickel & Co.."
Re: GEORGE A DICKEL & CO.